The master’s degree builds on a strong undergraduate background in electrical or computer engineering. Subject areas covered will initially include communication systems and networks, digital signal processing, computer systems architecture, and intelligent systems with additional emphasis areas planned for future offerings. Students can elect to engage in a research-oriented degree, a degree with a professional practice focus or a coursework-only option. This degree mirrors the program currently offered on Clemson’s main campus in requirements and expectations. A minimum of 24 credit hours of letter-graded coursework. The Focus Area Requirements for one of the focus areas in the major must be satisfied. At least twelve (12) credit hours of the letter-graded coursework must consist of ECE courses. At least twelve (12) credit hours of the letter-graded coursework must be at the 800-level or 9000-level. No credit for coursework at the 7000-level can be applied towards the degree requirements. No credit for either ECE 8900 or MATH 6000 can be applied towards the degree requirements. A student electing the thesis option in the M.S. program must write a thesis that is approved by the student’s advisory committee and the Graduate School. The student must also take a final examination administered by his/her advisory committee. At a minimum, the student must pass an examination consisting of an oral defense of the student's thesis. The advisory committee has the option of administering an additional written and/or oral examination on coursework. At least 18 credit hours of the letter-graded coursework must be at the 8000-level or 9000-level. No credit for ECE 8900, ECE 8910, or MATH 6000 can be applied towards the degree requirements. No thesis or engineering report is required with the non-thesis option, and there is no final examination. Prospective students must have a strong undergraduate background in electrical or computer engineering. Exemplary applicants with an undergraduate degree in other disciplines may also be eligible for the program. Students should review their academic background with the graduate student services coordinator. Undergraduate course deficiencies may be specified as a condition of admission for a student deemed to lack some necessary foundational background for the M.S. degree program. The student must remedy the deficiencies in a manner specified by the department prior to completing the normal requirements of the degree. The department provides several options for remedying an undergraduate course deficiency. For any option that requires a grade (such as a proficiency examination or the completion of a graded undergraduate course), a grade of A, B or C is required. A maximum of one third (1/3) of the required graded coursework may be transferred. All transfer coursework must be approved by the student’s advisor and advisory committee prior to being included on the GS-2. Coursework eligible for transfer must be: from a regionally accredited institution, graded with a B or higher, and is subject to the Graduate School’s six-year time limit for validity. Coursework applied towards the requirements of a prior degree earned by the student cannot be used for transfer credit. 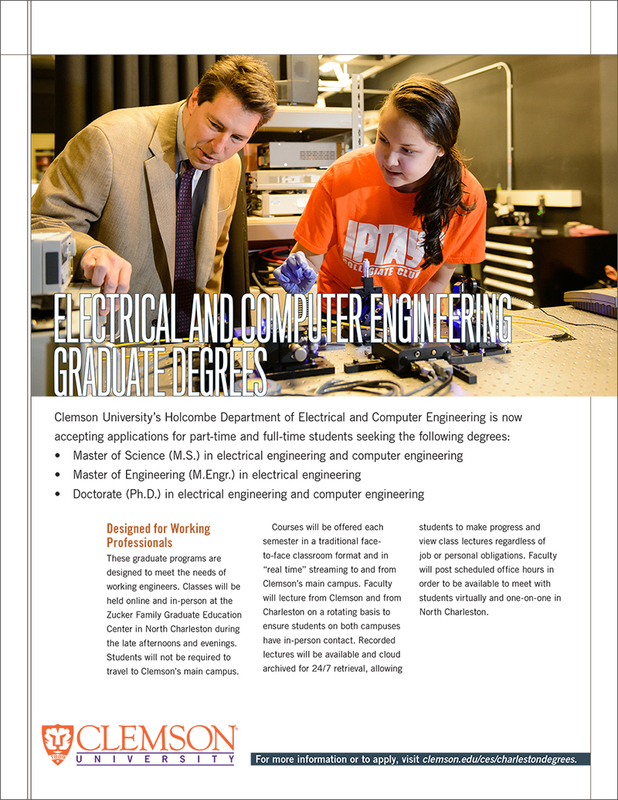 Students enrolled in this program may optionally have the opportunity to conduct research in Clemson University’s SCE&G Energy Innovation Center (EIC), which is among the world’s most advanced energy systems testing and research facilities. The Wind Turbine Drive Train Test Facility at the EIC is capable of full-scale highly accelerated mechanical and electrical testing of advanced drivetrain systems for wind turbines. The EIC also houses the Duke Energy eGRID, a 15-megawatt grid simulator that allows an electrical device to perform as it would under actual conditions anywhere in the world. A wide range of additional research opportunities may also be available through the Electrical and Computer Engineering Department. The GRE is required for application to the M.S. program. Prospective students are strongly encouraged to discuss the program requirements, curriculum, expectations and admissions process with the computer engineering graduate student services coordinator. To access the Graduate School application, click HERE. Cost information can be obtained by visiting the Tuition and Fees section of the Clemson Graduate School website. Computer Engineering is a Tier 2 program. For more information regarding the Master of Science in Computer Engineering - Cybersecurity (M.S. ), visit the departmental website.